Warwick Academy won the Middle School Swimming Championships in convincing fashion at the National Sports Center. Warwick Academy scored 280 points in winning the Middle School Division by 75 points over Saltus Grammar School who finished on 205. Bermuda High School finished third overall with 144 points. Somersfield Academy won all seven races in the Over 13 Girls Division. Myeisha Sharrief won both the 50m Butterfly and Freestyle races while Jaedyn Judd won the 100m Individual Medley and 50m Backstroke. Josephine Deurden rounded out the clean sweep with victory in the 50m Breaststroke. Somersfield also went on to win both the Freestyle and Medley Relays. Warwick Academy dominated the Boys Division and were led in the Under 15 Division by twin brothers Harlan and Flynn Watson Brown. Flynn was a double winner after he claimed Gold in the 50m Freestyle and Backstroke events. Harlan won the Butterfly and finished third in the Freestyle. 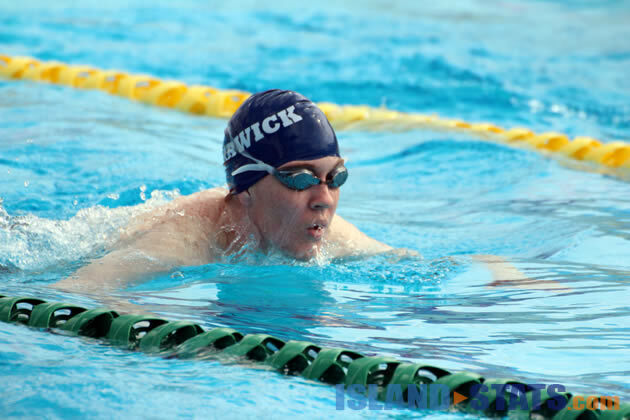 Warwick Academy rounded out the Division with Daniel Kunst winning the 50m Breaststroke and Brandon Adkins winning the 100m Individual Medley. Warwick Academy also cruised to victory in the Senior School Meet after collecting an impressive 384 points. They were clear winners over Saltus Grammar School who finished with 236.